Everyone looks to China to lead the global economy. The reason for this is that it, by far, had the largest growth rate across the world. The downturn in the global economy in 2016 was reversed in 2017. Many thought this was the start of another bull run. China was looked at as the provider for that growth. Latest statistics reveal this is not happening. Growth in China is not accelerating like many thought. It is slowing. This means the global economy is also seeing the same fate. This puts central banks of the world back on their heels. They operated as if 2017 was the kickstart to a faster improvement in the global economy. Now, they are confronted with a slowing growth rate. This looks scaring because some countries look up to China for technology production, to mention few, countries like Nigeria,Ghana, South Africa or let me say Africa in general import must of their products there. Some other Asia countries are not left out too. If you look at some phones and computers you will definitely see a part been identified as this part is made in China. Would not a collapse be a negative GDP growth rate? Depends on debt levels and cost of servicing debt. Growth falling below a certain amount can cause a crash if debt was taken on in the expectation of higher growth. Growth falling below a certain amount can cause a crash if debt was taken on in the expectation of higher growth. I see, I did not take into consideration excessive debt driven growth. A loss of trust in currency and a drop in the value would also cause a collapse, but the GDP figure may go up as the value (worth) of the currency is less. (So you'd be moving "more" money around, simply because the value has dropped so more is required to purchase stuff) This is probably why China and Russia are buying up a lot of gold and beginning to trade oil / gas outside of the pretro$ as the dollar is ready to fall off a cliff. what could have happened? that downward trend looks scary though. will this impact the economy of other countries since a lot of items are imported from china? sorry, i am not of an economist. just trying to understand what's going on. same here. with my very limited knowledge of economics, i can only conclude that if it's going up, it's good. in that scenario, of course, since it's downhill, then there's something to look into. It looks like China's just transitioning to a first world economy and thus slowing down growth rates. Is that GDP growth? GDP growth doesn't seem to be a good proxy for the health of an economy though. GDP growth is a good metric of an economy. GDP growth is still positive so China is looking good and will not collapse anytime soon no matter how many people online want that to happen. I'm a amateur Sinologist, student of geopolitics, and by absolutely no means an economist of any degree, but the biggest danger I see is not a global economic slowdown. It's "what will the Chinese Communist Party, who has built their entire legitimacy off of the claim that they saved the country's economy, do to keep the Chinese population's attention off of their failure to do this?" By way of an answer I would point to the sense of Jingoistic hypernationalism they have been drumming up over the past decade or so, and the Xi administration's unmasked bellicosity. If the Party decides their new claim to legitimacy will be "we are the ones keeping China superior to those 'lesser laowai nations,' as the Han, Ming and Qing Dynasties did, then they will not hesitate to return to the aggression that characterized Imperial China for millennia. Indeed, Xi's recurring catch phrase, most often translated as the "Chinese Dream of the Great Rejuvenation of the Chinese Nation," would be more accurately translated as "Han Dream of the Return to Supremacy of the Chinese Race." Weak economies launch major wars. History bears this out. Xi is spreading his own ideology with Maoist tactics. China is looking at a new Dictator. All this construction was preparation. It's a game of infrastructure, manufacturing, and fiat. China has been winning for some time, but they've been threatened by Trump's reversal. All countries could probably be considered failing empires.. and we know what happens right before.. It's only a matter of time before war breaks out. The only way forward is to bankrupt them, divide, and conquer through soft power and trade war. If we can accomplish that we might not even have to go to war. That statement is mildly sensationalized, but only mildly. Given the inherent frailty of China's entire economy (yeah I just said that), all we have to do is make them stumble once or twice and the series of crises that they have been waiting to address one-by-one in a planned order will all hit them at once, and we can just let China's history of "coast gets rich, interior gets poor, interior gets jealous, coast gets headaches" repeat itself for the umpteenth time. The only weapon China has that is worrisome is deception; specifically, in an age where power comes not from a nation's military but their ability to rally other nations to their side, they don't have to beat us in battle or economics if they can make the world THINK they have beaten us in one or the other. I have done an article about that recently, but I have another one pending that is a bit more specific to psychological warfare. Yeah maybe I do get a bit sensational, but I tend to think a few years ahead. It's inevitable that when a world power is challenged, war breaks out. China's growth rate was on the path to overtaking the US in about 20 years, and the US would never give up its unipolar status without a fight. China would more than likely prepare for that, and preemptively strike with deceptive espionage and cyberwarfare, since those are its strong suits. I agree with you wholeheartedly on psychological warfare. That's their best weapon, and it's time we ramped up ours. When the Chinese say they are "stunned" and "shocked" that Trump would ever think to call them out, I laugh. Because it's so easy for America to become the good guy. We have people in our government that have allowed them to perpetrate their soft power game without pushback. This battle starts internally, but if we conquer ourselves, they have no chance. I also totally agree with what you said about China's economy - their debt system is ridiculous. People see in charts what they want to see. Another article showed Bitcoin's descending triangle pattern and are convinced it will explode, because we all want cryptos to succeed. Here we arguably have a similar pattern and everyone says China will crash, because that's what they want to see. But the fact is, China's GDP growth has been above 6% for decades, and that's a very good growth rate. It also has the second highest GDP. In comparison, the US's (#1) is 2.27, Japan's (#3) is 1.71, Germany's (#4) is 2.51, United Kingdom's (#5) is 1.79 and France's (#6) is 1.85. You don't find a country exceeding China's growth rate until position #18 (Turkey's 7.05), then #32 (Ireland 7.81). I really don't see how anyone can say China's GDP isn't strong, simply by comparing it to past spikes. It's not possible to sustain 15.5% for 25 years. If it could, then by 2043, China's GDP would be projected to 517,074 billion, or 14.5 TIMES that of the US's projected GDP of 35,778 billion based on 2018 rates and GDP. No disrespect intended to the original poster...just an observation. Geez...It looks like the recent hardfork has created a bot-spam in the comments section...I don't recall them being so publicity advertising before this recent adjustment. It's quite a litter box in that it's difficult to get to the real interactive comments. It'd be nice if users could opt out of bot upvote comments. It'd be awesome if there was a plugin that did this. I thought the new resource system would get rid of spam but I might be wrong. It is just becoming a developed country with lower for longer growth. This not correct interpretation of the chart. The Chinese economy is still growing. Only thing its growth has become slow. And that is expected. As the size of the economy grows the growth slows down. Base effect. So nothing to worry based on this chart. Plus 5% a yr is still a healthy growth rate. Much higher than any other developed economy in the world. 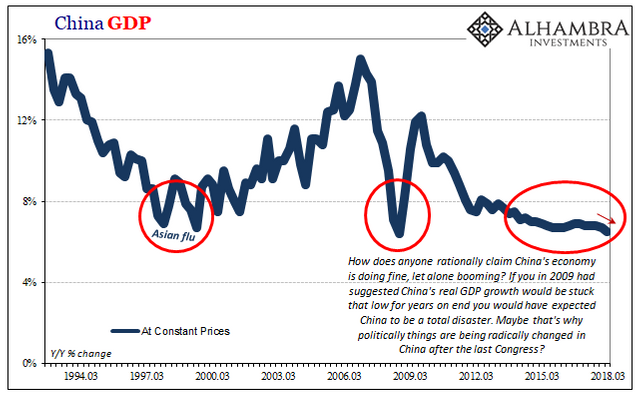 There is plenty of reason to believe China's GDP reports have been quite well-and-truly cooked for at least 15 years. Generally, living in Beijing and teaching Middle School students who laughingly tell me that they learned in math class how China's economic figures are mutually disproving (in terms I pretend to understand because math has never been my forte and they are using calculus), I have found that their economy shows all the evidence of roughly a third of the growth they lay claim to. Hi @finrep, I am looking a simple trend of stablishment, and a possible bounce in 6%. I think we need more indicators to define what will happen in the future. What I can see is that the curve remains above the 6% support, and it says that the market had not been important movements. So this is far from being a catastrophe, it's just not growing but looks very stable instead. And if they do not come to their senses soon and agree to fair trade, their problems will only get worse. That graph doesn't looks good! Since, we all know that most of our products are from China. Thanks for sharing this article, hope you will give us more information in regard to this very important news! Most of our products are from China and that graph indicates no good! This is such an important update. This for sharing. If the latest statistics do not reveal what is really happening, that's what I am scared off. I see danger out of it. I hope this is not the case with the global economy. Hoping this is not the case globally. Interesting post - this idea, however, assumes that continual growth is economically desirable. It might be argued that true economic health actually requires the curbing of unsustainable idealization of growth over stability. See "Sacred Economics" by Charles Eisenstein for some great discussion. It's still high growth. Which countries have growth over 4%? Hola. Harías un post sobre la economía argentina?